4-wheel compact foldable cart has a durable epoxy finish in choice of 4 colors. Cart has tubular steel frame and solid rubber wheels with steel spoke rims. A chrome finish model is available for an additional $10.00. 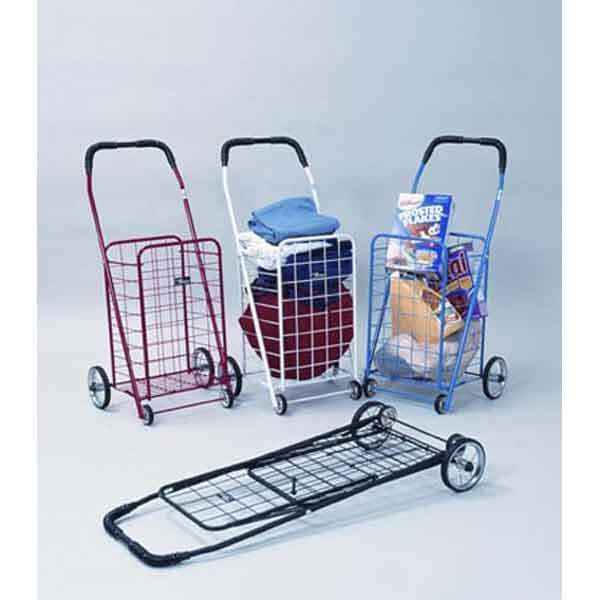 12.5" W. x 10.5" D. x 20" H.
19.5" W. x 37" H. x 17" L.
19.5" W. x 40.5" H. x 7" L.
This basket liner is designed specifically for the NTC003 folding carts. Bag size is 13" W x 20.5" H x 11.5" D.
The NTC003 & CL003 ship from the manufacturer's warehouse in New Jersey approximately 3 business days after an order is received. Please add regular ground transit times (UPS or FedEx) to this 3 day processing time to estimate arrival times.